ASK1 from other species may also be detectable. 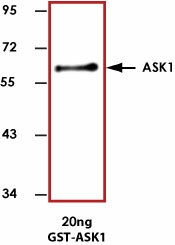 Sample Data :Representative western blot (1:1000) with Anti-ASK1 (A23) using 20 ng of GST-tagged human full-length recombinant ASK1. 1. Ichijo, H. et al: Induction of apoptosis by ASK1, a mammalian MAPKKK that activates SAPK/JNK and p38 signaling pathways. Science 275: 90-94, 1997. 2. Nishitoh, H. et al: ASK1 is essential for JNK/SAPK activation by TRAF2. Molec. Cell 2: 389-3105, 1998.